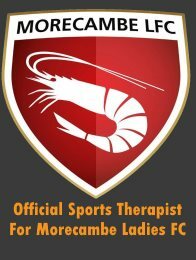 My sports therapy service is fully mobile, covering Lancaster, Morecambe, Garstang and all surrounding areas. By offering a mobile service, we can arrange your appointments in a location that is convenient for you. I can visit you in your home, workplace, gym, sports club or any other suitable venue. Rowan is highly knowledgeable, utterly professional and also very reassuring. My problems were alleviated greatly in the days after his visit, and I'm very reassured by his advice and help. I recommend Rowan unreservedly. An absolutely fantastic sports therapist! Rowan is very easy to talk to and listens to what you have to say and develops a plan that meet the needs to solve the problem. Even went the extra mile and went overtime to help with my leg problem. Thoroughly recommend!